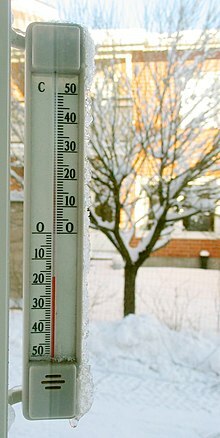 In 1743, the Lyonnais physicist Jean-Pierre Christin, permanent secretary of the Académie des sciences, belles-lettres et arts de LyonAcadémie des sciences, belles-lettres et arts de Lyon [fr], working independently of Celsius, developed a scale where zero represented the freezing point of water and 100 represented the boiling point of water. On 19 May 1743 he published the design of a mercury thermometer, the "Thermometer of Lyon" built by the craftsman Pierre Casati that used this scale. In 1744, coincident with the death of Anders Celsius, the Swedish botanist Carl Linnaeus (1707–1778) reversed Celsius's scale. His custom-made "linnaeus-thermometer", for use in his greenhouses, was made by Daniel Ekström, Sweden's leading maker of scientific instruments at the time, whose workshop was located in the basement of the Stockholm observatory. As often happened in this age before modern communications, numerous physicists, scientists, and instrument makers are credited with having independently developed this same scale; among them were Pehr Elvius, the secretary of the Royal Swedish Academy of Sciences (which had an instrument workshop) and with whom Linnaeus had been corresponding; Daniel Ekström[[[SV]] [sv]], the instrument maker; and Mårten Strömer (1707–1770) who had studied astronomy under Anders Celsius. ^ The ice point of purified water has been measured at 6995890000000000000♠0.000089(10) degrees Celsius – see Magnum, B.W. (June 1995). "Reproducibility of the Temperature of the Ice Point in Routine Measurements" (PDF). Nist Technical Note. 1411. Archived from the original (PDF) on July 14, 2007. Retrieved 11 February 2007.